In the Comune of Ameno, Mount Mesma is home to a quiet 17th century Franciscan monastery, set on a hill at 576 meters altitude. 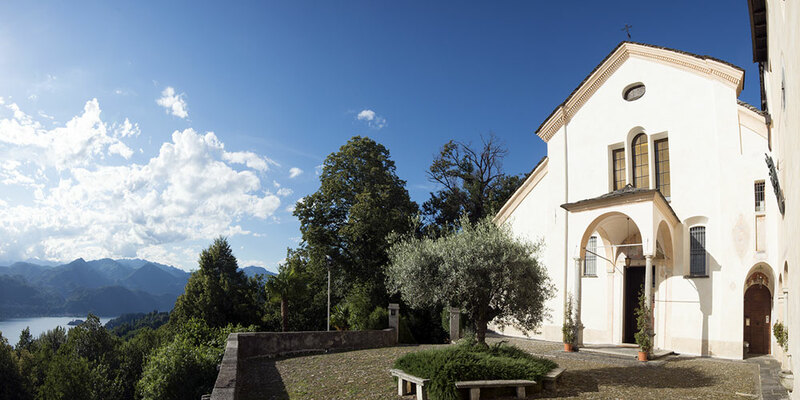 The view from the churchyard is stunning, drawing the eye not only towards the nearby village of Orta San Giulio and the most romantic if the Italian Lakes, but also towards the second highest mountain in Europe, the majestic Mount Rosa. In summer the Mount Mesma Fraternity offers a few spiritual activities for all who seek time to dedicate to prayer, silence and meditation, but they also have a warm welcome for anyone wishing to spend a few exploratory hours surrounded by the natural beauty of this place which can easily be reached either by car or on foot. The monastery and church were built in 1619 using stone left after demolition of a castle on the top of the hill. The single aisle is dominated by the large Crucifixion carved in 1712 by the Milanese sculptor Lentignani. There are two cloisters, the first of which is near the entrance and was used as shelter for pilgrims and passers-by. The second has a well at its center which supplied water to the community of monks. From here is reached the “room with the large stove” which has a stove in black stone from Oira which was built in 1727. You reach Lortallo by car to get to Monte Mesma, leaving the car in the car park there. You take the Way of the Cross up to the monastery in around 20 minutes. A slightly less steep road is the Chestnut Path, which is still 20 minutes walk but easier on the legs and feet. The monastery can also be reached by car on well kept tarmac roads.